No one goes about his or her life planning on one day developing a double chin. But it’s almost as if we all do — studies show that over two-thirds of Americans are bothered by our collective double chins. At the Center for Dermatology & Laser Surgery, we offer Kybella®, a non-surgical treatment to reduce or eliminate your double chin. Why do I have a double chin? The development of that sagging skin under your chin has two facets. First, is simply due to aging. As we age, our tissues naturally lose some of their strength and begin to sag. This happens across our bodies, but it can show itself in areas where gravity is a constant force, such as under the chin. Because the skin here doesn’t have any underlying bone to rest upon, any sagging shows. Second, under the chin is a popular spot for fat to collect. As we put on a few pounds with the years, fat tends to collect under the chin. 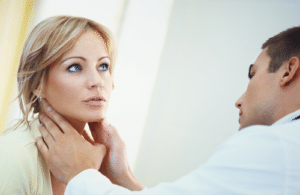 In the past, surgery — a neck lift or lower facelift — was the only way to deal with a double chin. And many people don’t want to deal with the surgery or the recovery that follows. Now there are various options for treating double chins. Probably the most successful is Kybella®, an injectable product that breaks down fat. Kybella® consists primarily of deoxycholic acid. Deoxycholic acid occurs naturally in the body; its job is to aid in the breakdown and absorption of dietary fat. Deoxycholic acid doesn’t differentiate between dietary fat and other fat that can be found in pockets under your chin. When Kybella® is injected into the fat beneath the chin, it destroys the fat cells. And it destroys them permanently, removing the storage mechanism to accumulate fat in the area. That means your double chin is gone for good, as long as you don’t put on a good deal of weight in the future. Is there recovery after Kybella® treatment? There isn’t any recovery after a Kybella® session at the Center for Dermatology & Laser Surgery. You may have some temporary swelling and tenderness at the injection sites, but this passes in a day or so. The FDA approved Kybella® for up to six treatments. Whether you need that many sessions depends on how much fat has accumulated under your chin. Most patients see visible results after just two treatments, but to get the full benefit of Kybella® most patients opt to have 4-6 treatments, spaced one month apart. Want to say goodbye to your double chin? Call providers at the Center for Dermatology & Laser Surgery, (503) 297-3440, to schedule your consultation today.